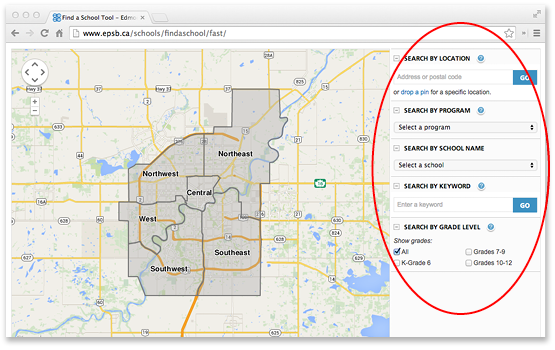 Use the Find a School tool to search by your address, program, grade level, or keyword. We've divided the map of Edmonton into geographic areas. Click on the map to zoom in and display all schools in that area. Narrow your search by using the tools and filters to the right of the map. Schools are represented by coloured pins. A key below the map shows the type of school represented by each pin. 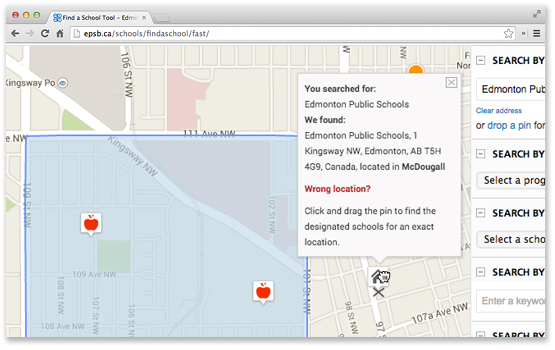 Enter your address to find your designated school represented by the apple pin. Sometimes the pin will drop into the wrong location, especially for residences in new or growing communities. If this happens, click and drag the pin to the right location to find the designated school, You can report a wrong address location to Google Maps. Scroll down to find a list of schools currently shown on the map, starting with your designated school if you have submitted an address. Zoom out on the map to view more results. Enter your home address to zoom in on the map and locate your designated elementary, junior high and senior high school indicated by the apple pin. Each grade has a curriculum determined by Alberta Education. Curriculum is what students learn in each subject area. Each of our schools teaches the curriculum through one, or a combination, of the following types of programming. Most schools offer regular programming, but no two schools offer it in the exact same way. All curriculum is determined by Alberta Education, but a school’s focus, optional courses and activities will vary depending on how it is organized to meet student needs. The District offers more than 30 alternative programming options. Students enrolled in alternative programming will receive instruction determined by Alberta Education, with a focus on arts, athletics, language and culture, faith or teaching philosophy. Students enrolled in special education programming will receive instruction determined by Alberta Education, as well as specialized supports based on their needs and abilities. Select a type of programming from the dropdown list. Schools offering that programming will display on the map as a coloured pin and in the list of results below. You can narrow your results by entering a word or phrase that describes a school or type of programming. program descriptor (e.g. autism, hockey, honours, upgrading, summer school, home school). Enter a keyword. 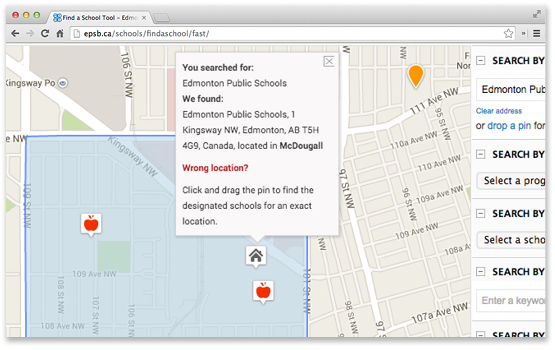 Schools that match the keyword will display on the map as a coloured pin and in the list of results below. Children who are four years old on or before March 1 may register in Kindergarten for the upcoming school year. Narrow your results by selecting the checkbox for one or more grade levels. 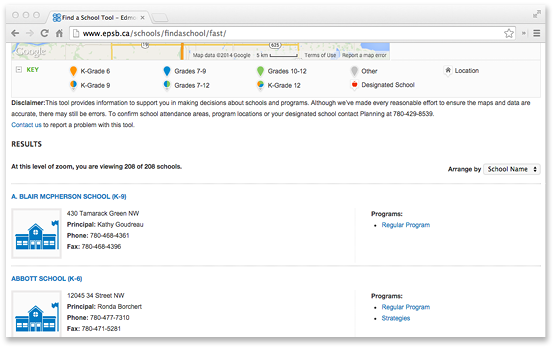 Schools offering programming for those grade levels will display on the map as a coloured pin and in the list of results below. Select the All checkbox to display schools at all grade levels. Find out how to prepare to attend an open house. When can I attend an open house? Schools host open house events between late January and early April each year. Not all schools host open house events. If you're interested in learning more about a school that is not hosting an open house, contact the school to schedule an appointment. During open house season (January to March), select the checkbox to show schools with open house events. 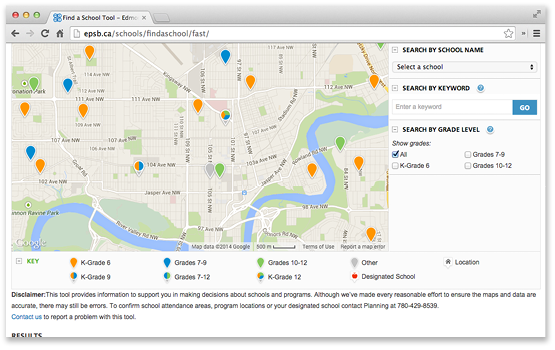 This tool provides information to support you in making decisions about schools and programs. Although we've made every reasonable effort to ensure the maps and data are accurate, there may still be errors. 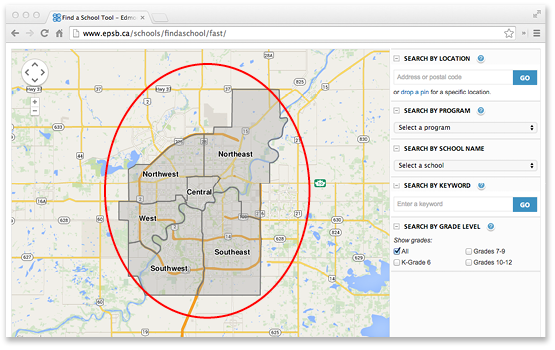 To confirm school attendance areas, program locations or your designated school, contact Planning at 780-429-8539. Report a wrong address location to Google Maps.